Download and print worksheets for teaching students about animal and plant cells. 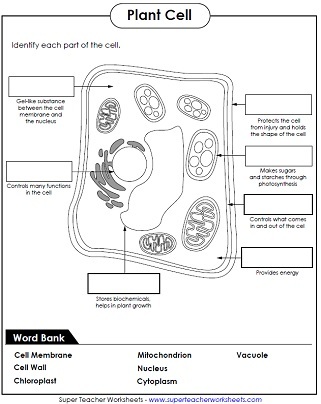 We have cell diagrams with and without labels, as well as vocabulary activities. 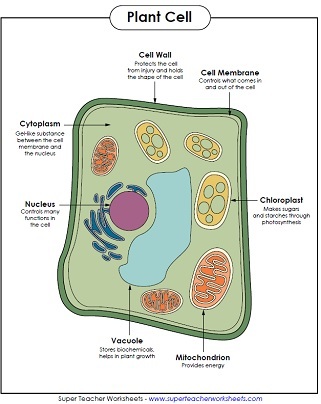 Write the name of each animal cell part shown in the diagram. The illustration includes definitions. Color the animal cell picture. Use the color-key at the bottom of the page. Cut out the organelles and glue them in the animal cell. This is a poster with a diagram of basic animal cell parts. Hang it in your classroom, or have students glue it into their notebook. These cards can be used as a matching game or glued into students' science notebooks. Words include vacuole, mitochondria, nucleus, cytoplasm, and membrane. Students will learn all about cells in this reading comprehension article. What are cells? Why are they important? What are some basic characteristics of cells? These questions and more are explored in the article. Comprehension questions, vocabulary words, and a writing prompt are included. Identify each part of the plant cell. A diagram is shown, along with definitions. Students write the name of the cell parts in the boxes. 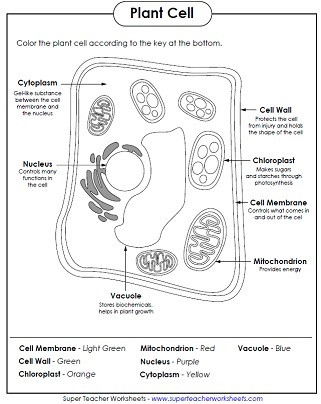 Color the picture of the plant cell according to the key at the bottom. Diagram includes words and definitions. Cut out the organelles and glue them onto the plant cell. Color the cell and its parts. This is a basic illustration of a plant cell with major parts labeled. Labels include nucleus, chloroplast, cytoplasm, membrane, cell wall, and vacuole, and mitochondrion. Use it as a poster in your classroom or have students glue it into their science notebooks. This file has 14 vocabulary cards (7 words and 7 definitions). Use them to play a matching games, as flashcards, or as foldables for student notebooks. We have science worksheets for many topics, including animal classifications, food chains, electricity, magnetism, human body, and simple machines. This page has worksheets, articles, and activities to use when teaching students about the human body. There are worksheets for teaching about the heart, lungs, kidneys, brain, bones, intestines, and stomach.